At Calusa Fishing Adventures we pride ourselves on customer service, customizing each trip to fit your fishing desires and dreams. Each and every Calusa trip is a true fishing adventure. Whether you’re an experienced angler chasing a trophy fish, or a family looking to have a good time catching fish and making lasting memories we can provide the right trip for you! We have many years of successful fishing experience. Captain Mark grew up fishing these waters and knows where the best fishing spots are based on the season and weather conditions. There is more to being a good guide than just finding fish, no-one wants to spend a day with someone they don’t like or is not fun to be around. Cape Coral the largest city in Florida other than Tampa and Miami, it was originally purchased and developed in 1957. The entire area is a large peninsula bordered by the Caloosahatchee river and Matlacha pass making it an inshore anglers dream. There are numerous areas to fish in Cape Coral and the type of structure varies also. There is Mangrove edges, oyster bars, bridges and flats. In the winter time the Caloosahatchee river is a great area to fish for Redfish, Snook, Spotted Sea Trout and even Tarpon. Like wise Matlacha pass is known for its world class fishing. 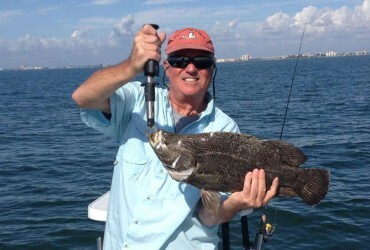 Captain Mark provides Cape Coral fishing charters for clients year round. When hiring a Cape Coral fishing guide its important to find one who is professional, fun, family friendly and loves what he does. Captain Mark is all of these and more! For the best Cape Coral fishing charters call Captain Mark Yimin today at 941-677-FISH or book online now! Calusa Fishing Adventures is fully licensed and insured, we are also proud members of the Florida Guides Association. Captain Mark took my 15 year old son, Travis, and myself out on a great inshore fishing trip. He knows the waterway extremely well and knew where the fish would be. With so many fishing charter options in this fishing paradise, it is hard to pick one as I am sure most are good and you will catch fish, but finding a Captain who is friendly with a great personality might be harder to find. Captain Mark is that guy! He is super nice, great personality and was great with my boy. We had a blast and enjoyed sharing our time with him. I will be back on his boat, which was perfect for this application, every time I am in the Ft Myers area!! Mark really knows his stuff! He recently took my brother and I on a fishing excursion in Estero Bay where we were fortunate enough to catch over 40 fish in just 4 hours including 7 different types of fish. It was awesome! We caught lots of snook, snapper, jack, lady-fish, flounder, mackerel, and red-fish. This would not have been possible without the experience and guidance of Mark as he knew right where to be and when to be there so we could take full advantage of the conditions. I highly recommend Mark with Calusa Fishing Adventures to anybody looking to have a great fishing experience and we will definitely be going back! Best captain around. Fun and fish, excellent time. Highly recommend. Captain Mark did a fantastic job getting my 8 & 11 year old kids to the perfect spot all day. Tons of age-appropriate action, the kids had a blast. I’ve used several charters in the area, I recommend his as the best without reservation. Mark is one of the best fishing guides I have had in many years. I live locally and like to treat myself occasionally to a fishing day with an experienced guide. Calusa Fishing Adventures was perfect. Mark was professional, funny, and put me on some great fishing all day. I would recommend Calusa Fishing Adventures to anyone! Happy fishing!! 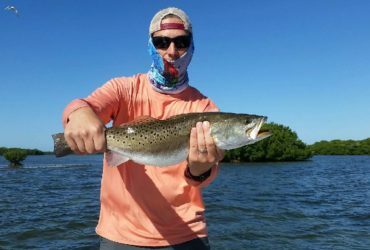 I would recommend Captain Mark to anyone looking for a guide in SW Florida. Mark is reasonably priced, hard working and extremely knowledgeable with where to find the fish and what to use to get them. I would definitely use Captain Mark again. Next time Captain Mark, you’re taking me for Tarpon……bow to the king! Outstanding in every regard! Capt Mark Yimin is a dedicated and hard working guide that knows where to find fish. 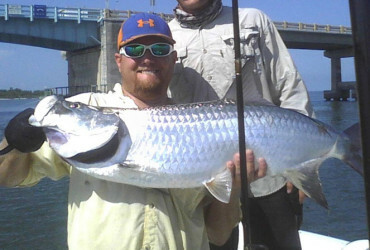 My buddy hooked and landed the tarpon of a lifetime! Professional, arrives early and stays late to make your experience flawless. We will be back! Great guide, great boat and great memories. 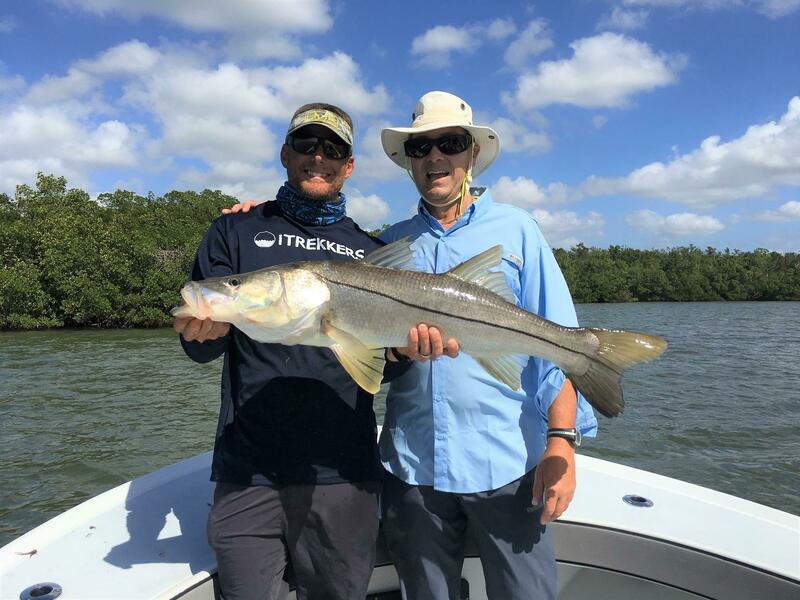 Dad and I caught our first snook together. Mark is a local. Knows the bay and is super patient. Helps with baiting, casting and catching fish. Caught snook, redfish & trout even in tough conditions. Will call him next time for sure. Thank you!!! Was one of the best fishing carters i have experienced thanks Mark.